Anchor Brewing Liberty Ale, served in a 20 oz. pint glass. I hate to say this, but some Canadians get a bit smug about American beer. “Budweiser?” they say. “You call that beer?” They then descend into a misinformed tirade about American beer being weak, tasteless, and only adequate when served colder than a January night in Alaska. Sadly, these America-bashing know-nothing knobs consider themselves experts in American beer because they once fished a can of Bud Light out of a cooler at a bush party. Let’s think about this for a second. Would you, fellow Canadian beer drinker, want Americans to judge Canadian beer based on a passing encounter with a can of Lucky Lager? I should hope not. Real beer geeks know that the U.S. has an amazing range of spectacular craft brews. Whatever beer style you want, there’s a reasonable chance someone in America is brewing it. Anyone who thinks U.S. beer begins with Coors and ends with Pabst’s hipster elixir doesn’t know a damn thing about brewing. And so, to celebrate U.S. 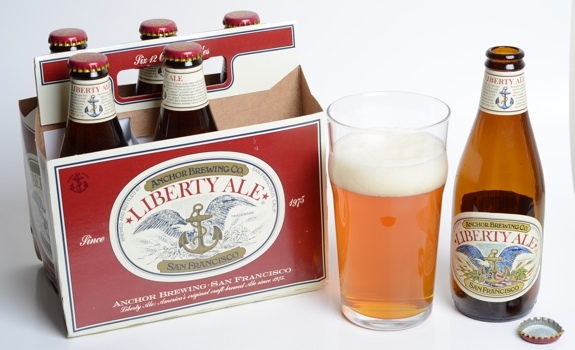 Independence Day like the friendly Canadian neighbour I am, here’s a lovely beer that proves the point that the States makes some fine brews: Anchor Brewing’s Liberty Ale. The head pours big and foamy above the golden, slightly hazy beer below. The aroma is hoppy, with grapefruit and citrus up front. The hops leap out and dominate the taste. Grapefruit leads the charge, with a whole lot of hop bitterness right from the get go that lingers in the aftertaste. The soft carbonation is just right. There are some other tastes kicking around in there, but the hops are the star attraction. The alcohol is apparent, which isn’t surprising given the 5.9% a.b.v. potency. I’d pair it with a burger off the barbecue, or something else with enough taste to stand up to it. A creamy curry would do the trick. You've gotta love those nifty Anchor Brewing bottles. Cost: $15.49 for a six-pack of 12 oz. bottles at Devine Wines in Edmonton. Value for cash money: A bit pricey for a six-pack. The verdict: Hold your head high, America. 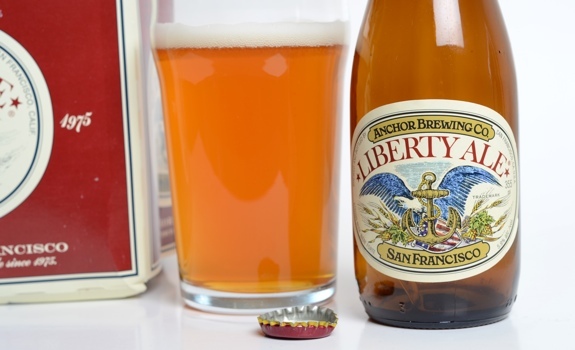 The right kind of Canadians know you make delicious beer, and Anchor’s Liberty Ale does your nation proud. But anyway, Lucy’s website is http://www.beercook.com/ …scroll down, recipes & a link to more are near the bottom of the page.